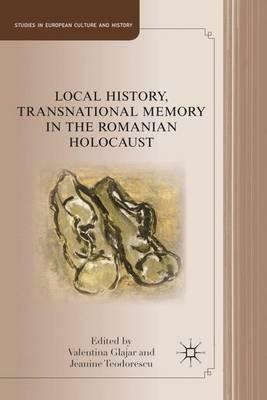 This book explores the memory of the Romanian Holocaust in Romanian, German, Israeli, and French cultural representations. The essays in this volume discuss first-hand testimonial accounts, letters, journals, drawings, literary texts and films by Elie Wiesel, Paul Celan, Aharon Appelfeld Norman Manea, Radu Mihaileanu, among others. Illustrations note 13 Illustrations, black and white; XI, 275 p. 13 illus. VALENTINA GLAJAR Associate Professor of German at Texas State University, San Marcos, USA. JEANINE TEODORESCUteaches at Columbia College Chicago, USA.